It recently came to our attention that people tend to mistake a well-known hip-hop artist, Mr. Kanye West, for a small child. Further examination proved this to be a very easy mistake to make, indeed. 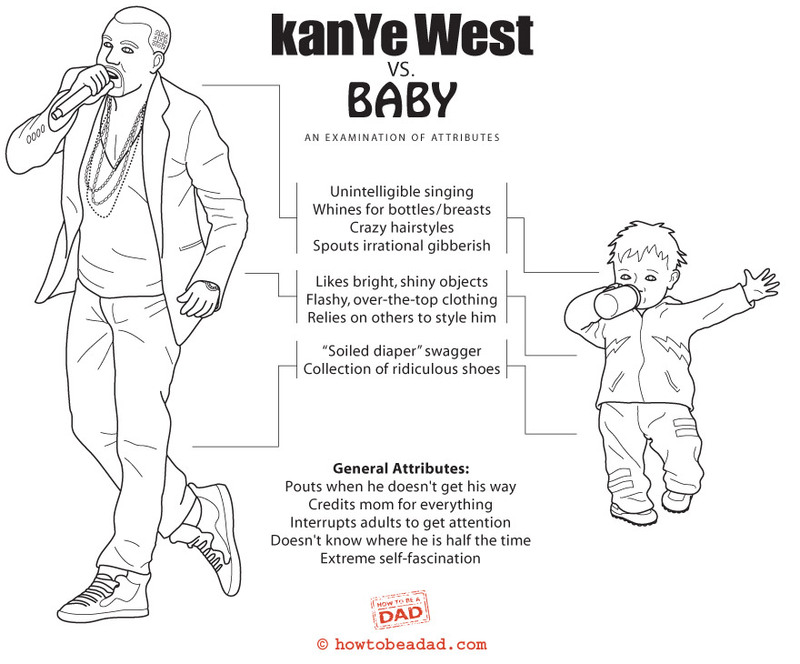 So, for your own scientific assessment and review, we present to you: Kanye vs. Baby. This instructional diagram could potentially hold the key to your own success in the raising of a baby or the care and management of a humorless, ego-maniacal celebrity with a fondness for rhyming words, autotune and 808 drum machines. Liking our Facebook Page is the BEST way to stay connected to our madness. Heck yeah. Check them all out. Yeah, you read that correctly. Love love love this! Why didn’t I find you guys earlier? You were probably busy trying decipher Kanye’s Twitter feed. That’s a pretty consuming and lengthy endeavor. Did I say lengthy? Nay! Endless. Who needs Kanye tweets now that I’ve found your site? That question is the right answer, grasshopper. The pebble has been snatched! This is hilarious! And so true. It was a real revelation when we came up with it, like it was toooooo easy. Kayenne pepper… it burns in your mouth and in your mind. Ow! Thanks Stephanie. 🙂 Was a fun one. Hahaha. Awesome. Next: Kanye vs. Zombie 😉 lol. Naw, that would just create some crazy wormhole or something. YOU DON’T OWN ME OR KNOW ME. MY RAPS MAKE THE WORLD TURN. PEOPLE LIKE DAYTIME. I JUST SMILE AT THE PAIN. I PUT PERSPECTIVE TO THE PEOPLE’S PAIN AND MAKE THE SUN COME OUT. THAT IS HOW THEY CAN SEE ME. Oh man! This is too good to be true! Ha ha ha ha ha! That said, I do like daytime. I take offense at this allusion and by its comparison, the implications about my behavioral and sartorial choices. This shall not stand, Dads of HowToBeADad.com. I challenge you to a death-duel, Mr. West. A death-duel. Bottles & Breasts, Baby! We apologize for the insult. We would publish a formal retraction and delete this post… but it’s reeeeeeally funny! So… for what’s worth (nothing) sorry again. P.S. Good luck with those teeth. They’ll be your friends, but not before they’ve been your enemy. Yo Kanye, Ima let you finish, but my toddler is the best dancer in the WORLD! Ha ha ha! Brilliant! So glad you let him finish too. He gets pretty uppity about that. This made me laugh, especially after watching Kanye’s new soul-destroying ‘Monster’ video which also features Jay-z and led to me demanding that my husband never listen to any of his music ever again (he good-humouredly agreed). Rachael, you’re a very caring wife, because your request that he never listen to his music again will likely avert a gruesome murder suicide. And if that isn’t caring, I just don’t know what is. BTW, your added items are approved. We actually had to cut half of the points for Kanye’s comparison so it would fit, these things seem to write themselves. Yo Andy, I’m really happy for you… I’mma let you finish. But Zombie vs Baby had one of the best instructional diagrams of all time! Your web page is like pie, they are cute and cute. I’ve just walking from each web page to page except I met stunning topic in this page. From first impression, I underestimate your topic ideas, nevertheless it is my fault, sorry for pondering this (I told you what I thought in my mind). Here’s my bad habits, sorry to listen to that. Although it became my bad signal for future, however I notice that my mind can be used for other experimental study with you. Please discover that I write this comment according to true story, and you’re the chosen one to make this decision. I need you to changed into my partner in desired subject, we can research along with our skills, and you get the benefit by receiving new experience with me. Sorry for giving my invitation on this remark page, but if you don’t mind, you could possibly give me your opinion about my comment, I’m interested in developing your website online as huge web page, so that you can use it as your passive income. Ha ha ha ha! This is the longest wacko spam comment we’ve ever received, and we’re like pie, so I had to let it through. The rest of the world needed to see this amazing FAIL of “online marketing.” Ha ha ha ha ha! Yeah, those share numbers look like the number of times I’ve fallen asleep writing a post. I wouldn’t just because it involves Kanye. But I think it’s funny. Derek must be the lone remaining Kanye fan out there. It’s okay Derek, we all have things we like for which we can be ridiculed. This post has new relevancy now that Kanye and Kim will have a spawn. Where to even go with that…?